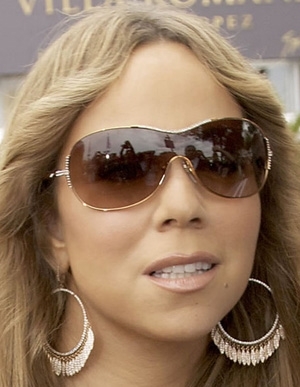 Mariah Carey’s been looking a bit rounder than usual during recent public performances, but she still refuses to confirm or deny the preggo rumors that have been swirling around for the past few months. Her much younger hubby Nick Cannon—Mimi’s 40 and Nick’s 29—has been keeping his lips zipped, too. Her weight has fluctuated a few times over the years, but it’s pretty strange for a diva that loves to glam it up like there’s no tomorrow to be spotted in baggy T-shirts. 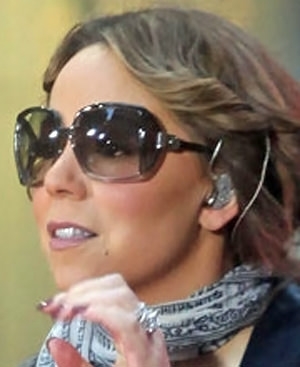 Even so, she’s looking hot in these Salvatore Ferragamo sunglasses. The rims go perfectly with her earrings, don’tcha think?